Pololu valley is the most northern of the impressive valleys that are carved into the Kohala volcano at the lush green pastures of the Kohala region on the Big Island. The spectacular views of the valley and the steep cliffs that end in the ocean are worth a trip on their own, but the real thing to do here is hiking to the black sand beach at the valley floor! There also are some pretty cool things to do close to Pololu valley to make your visit into a small road trip. The Kohala Volcano last erupted about 120.000 years ago (!) and is the oldest of 5 volcanoes that make up the Big Island. Between 250.000 and 300.000 years ago the Kohala volcano experienced a truly massive landslide in which a part of the volcano fell into the ocean. This landslide is responsible for the now famous sea cliffs on the windward Kohala shoreline but also triggered a giant tsunami that left marine deposits multiple 100 ft high on the other islands (read more). Remnants from this landslide can still be found under water 81 miles (130 km) from the current coastline. (read more about the geological history of Kohala). The spectacular cliffs of the Kohala coastline were formed during a catastrophic landslide between 250.000 and 300.000 years ago during which a large part of the volcano slipped into the ocean. During its long lifetime, erosion by rainwater has cut multiple deep gulches, gorges and valley in the flanks of the windward side of the Kohala volcano. You can see this now as a series of 7 valleys (a valley has a flood plane at the valley floor) of which Pololu Valley is the most northern one. Water has eroded 7 deep valleys into the windward side of the Kohala Volcano of the Big Island. 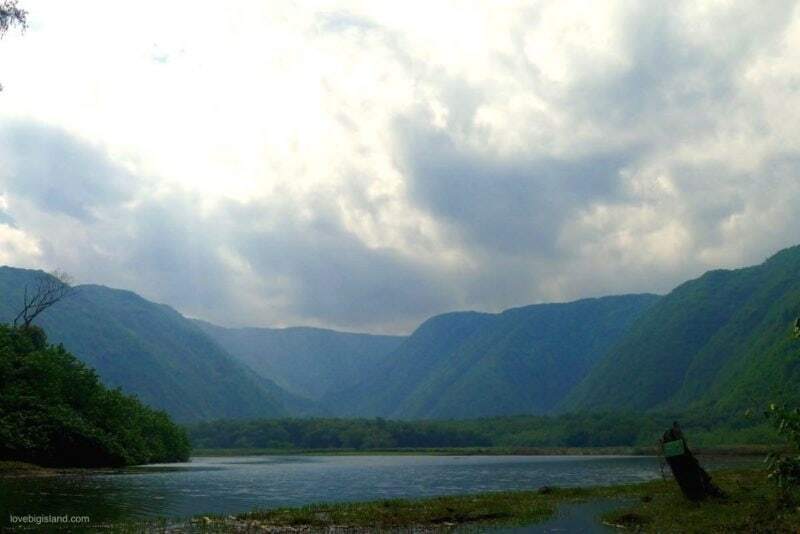 The water that carved out these valleys is also the reason why these valleys were a popular place to live for the native Hawaiians: a constant supply of water is essential to grow culturally significant crops such as Taro. The steady supply disappeared in 1905 when the Kohala Ditch network was completed. This 22 mile network of flumes and ditches is essential for the water supply of a part of the island but also made sure that there are no permanent residents anymore in Pololu Valley. The distance from the overlook point to the valley floor is 490ft (150m). 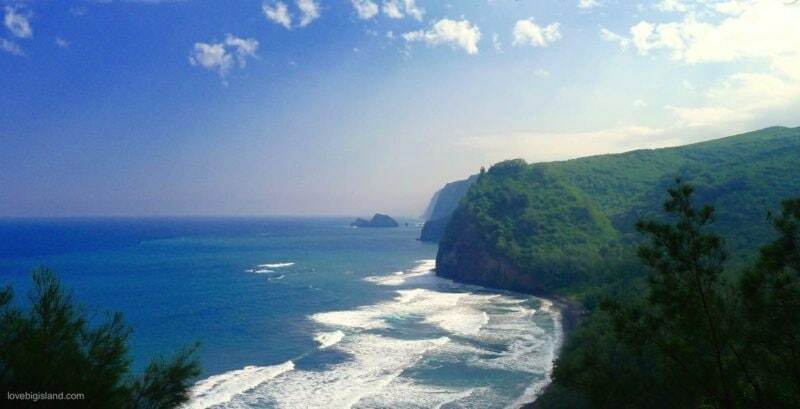 From here you have a magnificent view over Pololu Valley and the impressive sea cliffs that slowly crumble into the ocean. If you are visiting in the winter months (from ~December to ~March) this is a great place to try and see humpback whales. Pro tip (for the early birds): The Pololu Lookout is a GREAT spot to watch the sunrise! You can stick around for 10 minutes to snap a few pictures of the breathtaking coastline and take in the scenery but the real attraction at Pololu is the short but steep hike down into the valley and the black sand beach at the valley floor. 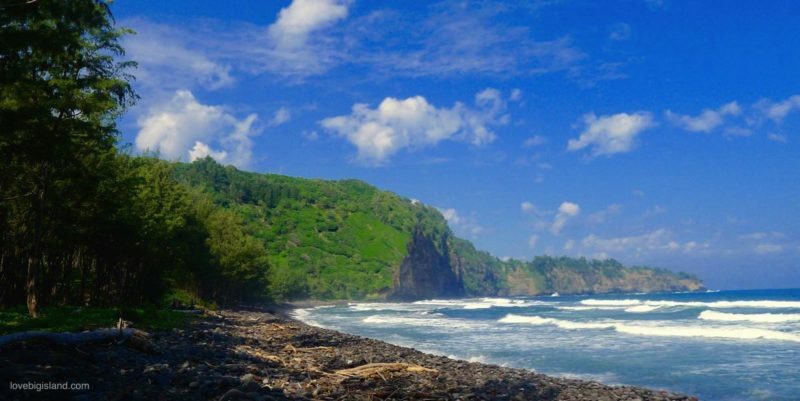 The Pololu Valley Lookout gives a spectacular view over the cliffs of the Kohala volcano. Pololu Valley is located on the eastern slope of the extinct Kohala volcano at the northernmost point of the Big Island. To get there you have to follow the Akoni Pule Highway (highway 270) until it ends ends 8 miles east of the town of Hawi at the Pololu Valley lookout. The trail down into the valley is a section of the old government road to ʻĀwini. For this reason it is both referred to at the Pololū Trail and the ʻĀwini trail. The trail itself offers breathtaking views of the cliffs, the valley and the black sand beach on the valley floor. 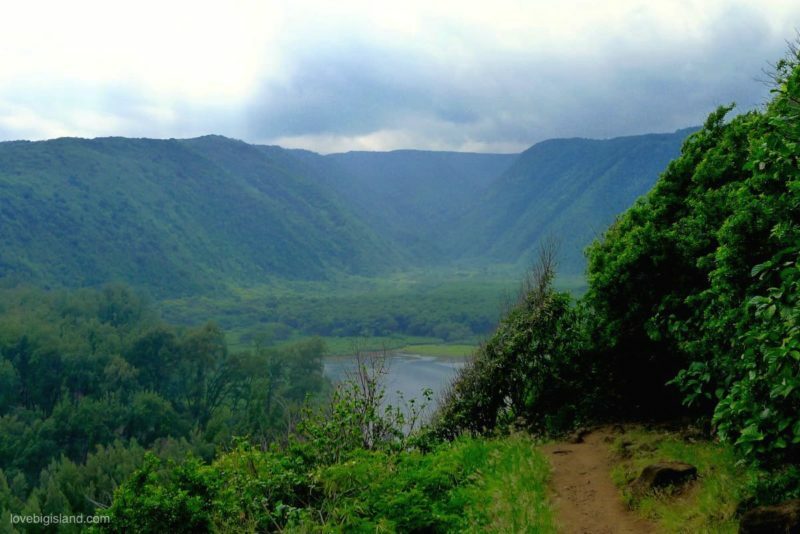 This is a gorgeous walk with stunning views and one of our 5 favorite hikes on the Big Island! The hike down the side of the cliff to the valley floor is short but steep: ~420 ft in 0.6 miles (126 meters in 1.0 kilometers) and takes about 20 to 25 minutes for the average hiker. From the valley floor it is a short and easy stretch to the beach. During or after rains the trail can be slippery and because of the relatively steep average grade of the trail (13%) we rate the difficulty as moderate. Don’t worry, there is plenty of time on the beach to take a breather! 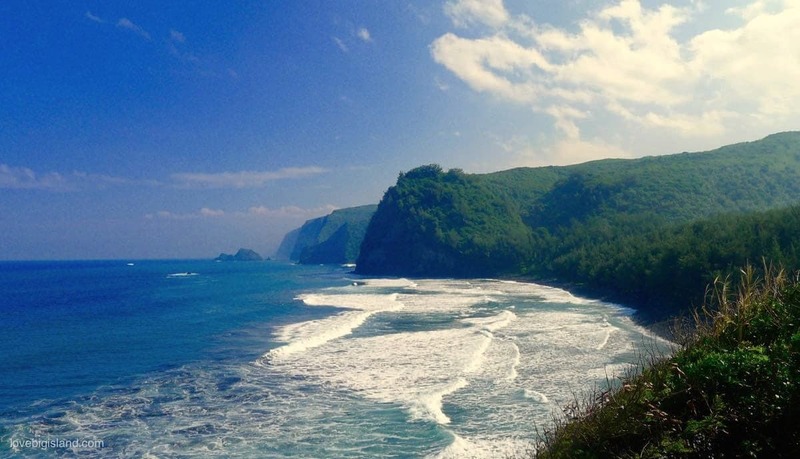 As we do for most places on the Big Island we recommend to visit Pololu Valley early in the day. Not only will you beat most of the crowds but you will also benefit from more pleasant temperatures. It can get especially hot and sweaty during the hike up! Bring enough water with you and keep in mind that there are no restroom facilities in valley or at the lookout. The black sand beach at the valley floor looks like a beach at the end of the world. A lush tropical forest surrounded by almost 500 ft high cliffs and fronted by an ocean that more often than not has high surf and rough waves. The beach itself is made out of a mix of black sand and large boulders. These stones can make it uncomfortable to walk into the water so if you do want to take a swim try to bring shoes that can get wet. The ocean at Pololu valley is not a safe place to go swimming. High surf, undertow, and rip tides are frequently present so only go in the water if you are a good swimmer and don’t get in too deep. The black sand beach at Pololu Valley can be rocky if a storm has washed away the black sand. Behind the beach you can find large dunes and ironwood trees that protect the valley from floodwaters. There are some trails parallel to the beach that make it easy to get to the other side of the valley (and continue the hike to other valleys) that are worth exploring if you have 20 minutes and a bit of energy to spare. Keep in mind though that the the land further back is privately owned and that there are sacred burial sites deeper in the valley. Don’t venture too far inland to avoid trespassing and disturbing sites that shouldn’t be disturbed. The stretch between the Pololu valley lookout and the black sand beach is only the first part of a more extended trail. You can follow this trail over the valley floor and up the other side to the next valley: Honokane Nui. 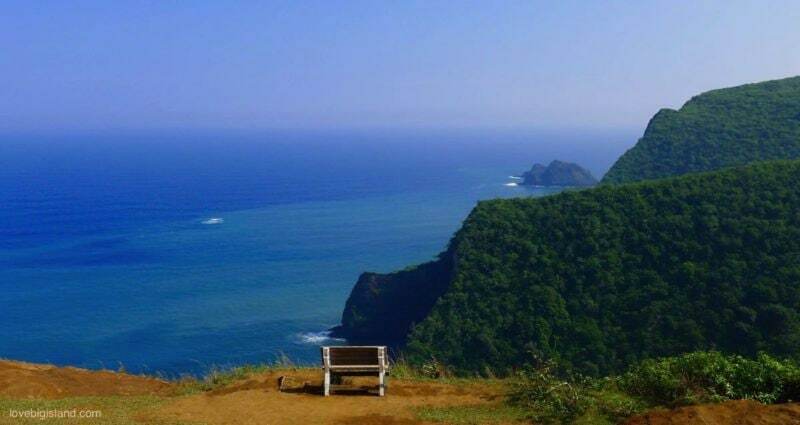 The trail climbs the eastern ridge of Pololu through a series of muddy and often slippery switchbacks and leads to a wooden bench that overlooks the Honokane Nui Valley and part of the Honokane Iki Valley. You can find a more concise description of this hike at the bigislandhikes website. Unfortunately it is not safe to follow the trail any further because part of the trail came down in the 2006 Kiholo Bay earthquake. Pololu valley is at the northern tip and part of the oldest (of 5) volcanoes that make up the Big Island of Hawaii. Because the valley is at the end of the road you will pass a few cool places and things to do that make it easy to make visiting Pololu valley part of a half or whole day road trip. Keokea beach park is a quiet beach park with a shower and picnic tables close to Hawi and Pololu Valley (2.5 miles, about 10 minutes by car). This is a good spot for a picnic and a shower after hiking down into Pololu valley. More information at the Keokea beach park website (Hawai’i County). ATV outfitters offers several tours that last between 1.5 and 3 hours on their property between Hawi and Pololu Valley. Read more about ATV tours on our website. The leeward side of the Kohala volcano is one of the best places on the Big Island to see whales from the shore. If you are going to Pololu Valley during whale season (between ~December and March) and want to include a whale-watching picnic to your visit you should start by checking out our DIY whale watching tips. The Sushi Rock Restaurant is out favorite place to eat on this part of the Big Island. They source local and organic ingredients whenever possible, the service is warm and friendly and their sushi is really good! The restaurant is open for lunch and dinner, for more information see the Sushi Rock website.